We show you how to use all kinds of FREE and low-cost marketing so you can start landing foreclosure cleanup work practically as soon as you open your doors. 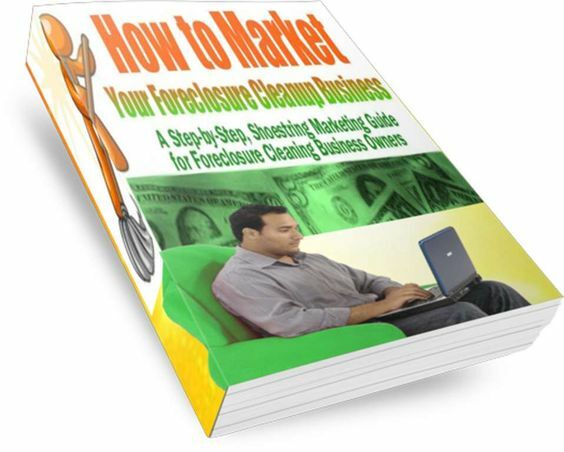 The FIRST and Most In-Depth Ebook You'll Find on How to Market Your Foreclosure Cleaning Business! This ebook is a companion to the best-selling, How to Start a Foreclosure Cleanup Business. It tells you everything you need to know to successfully market your foreclosure cleaning business. Whether you are a seasoned business professional or a new business owner, the free and low-cost techniques and samples included will help you to grow your foreclosure cleaning business as fast or as slow as you want. As with the first ebook, this one was written because of customer demand. So many who bought the first ebook wanted more detail on how to go about acquiring clients for their foreclosure cleaning business. So within, I lay out all the free and low-cost ways I've used for years to get clients as a realtor -- and now as a foreclosure cleaning business owner. Marketing is a skill -- a skill that must be developed to succeed in any business. As the title says, I only discuss shoestring, ie, free and low-cost marketing methods. This is because I know firsthand that most small business owners who are just starting out have little or no money to market. But, that shouldn't stop you from starting a business! In fact, with the advent of the internet -- and especially in this type of business -- getting clients has never been easier or cheaper. Once you finish this ebook, you will have everything you need to effectively -- and cost consciously -- grow your foreclosure cleanup business. You don't need to shop around, do more research or wonder if there's something you're doing wrong if business is not going your way. If you follow the marketing methods outlined within -- consistently -- you WILL get business. Good luck as you start on this amazing journey. While owning a foreclosure cleaning business is hard work, it is also very rewarding -- financially as well as personally. Following is a detailed Table of Contents. 134 Pages of First-hand Marketing Wisdom to Get the Phone Ringing! I have a degree in advertising and communications; hence, in this section I kind of take you to small business marketing school, so to speak. In discussing the various methods, I explain to you why it's important to do x, y and z; why a method is effective, when to use it, what niche to target; etc. This section will help you to become a better marketer no matter what kind of business you have. Cheap, Easy, Effective Online Advertising! If you haven't used e-mail to promote your foreclosure cleaning business, you are missing out. E-mail is probably the most effective -- and easiest -- method to use when marketing for jobs in this niche. And it's very cheap. We divulge in detail how to use it to get the best results. If you choose not to sign up with a list management company, you can do what we call "quick and dirty" email marketing. What is this? We tell you what it is and how to do it the free, easy way! Writing for Dollars! Marketing with newsletters is like writing for dollars. Why/how? If you spend anytime on the Internet at all, then you know that it seems everyone has a newsletter (aka e-zine, e-newsletter). You may question, "Are they effective?" And the answer is a resounding, "Yes!" We tell you the most important reasons why -- as well as how to set one up and distribute it for free! Postcards are Cheap, Effective Marketing Magic! I don't care what your business is, it can be marketed via postcards. And, they're cheap. You've received postcards in the mail from local gyms, the dentist, the eye doctor, etc. Because they're uncovered (no fussing with glue or clasps on envelopes), postcards are enormously popular. You'll learn the benefits of using this effective marketing technique, where to get them, how to put together an effective mailing -- and more! Use Marketing Might, Not Marketing Dollars! This one marketing tool has garnered Foreclosure Cleanup a lot of business -- in addition to raising our professional profile in the community. And the best thing about it? It's free! Did you see the news clip on our site featuring the business? We got on TV because I use press release marketing. I'll show you the exact email I sent to get this coverage -- and how you can too! Write and Distribute Articles to Get FREE Exposure for Your Business. This method costs absolutely nothing to implement. We'll tell you how to it to get the word out about your business. In fact, you'll never have to spend money to market your business if you use this method consistently. You Can Increase Sales & Generate Leads for the Cost of a First-Class Postage Stamp! Sales letters cost only 42¢ to mail (cost of first class postage as of this writing). They are a highly effective way to get the word out about your business. With our samples, you will know exactly what to put in an effective sales letter to get the phone ringing. Get in Their Face! One frequently overlooked marketing method is face-to-face marketing. You can do this in a number of ways -- all of which we'll explain. We'll tell you exactly what to say and how to turn these meetings into repeat business and referrals. Having a Website is a Necessity to Grow Your Foreclosure Cleaning Business. As we discussed in Chapter 15 of the How to Start a Foreclosure Cleanup ebook, in today's world, not having a website is pretty much the equivalent of not have a telephone, especially in the real estate industry. And this is exactly the business you're in, even though your focus is on foreclosure cleanup. We'll tell you exactly what to do to get a website, how much it should cost, tell you about some do-it-yourself options, explain what you absolutely must put on your site -- and so much more. We do all of this in simple, easy-to-understand language. In this section, I list three special reports. Again, this is kind of taking you back to small business marketing school. They are marketing facts and principles I've applied to various businesses over the years. These reports contain some wisdom I've learned the hard way. Following the advice divulged, you can severely shorten your learning curve and make your foreclosure cleaning business a success that much sooner. There's nothing like this ebook in print, on the internet or in bookstores! It is the only one of its kind and is chock full of first-hand marketing info anyone can use to grow a lucrative foreclosure cleaning business.